Common Core Informational Text Standard RI3 is a unique standard that balances critical thinking with textual evidence. This standard might be my new favorite (do I say that for every one?) standard. This standard really puts the responsibility of making connections in the students’ corner. When you plan an effective Common Core lesson for this standard, you want to be sure to deconstruct exactly what your students need to know. While this Common Core standard looks marginally different for each grade level, the core is that students must connect people, ideas, and events. Instead of teachers asking literal comprehension questions about a text, students look at the people, ideas, and things that happen in a book to make some decisions about how they are related. How cool is that? So, let’s look at this standard and how it varies in a few different grade levels so you can see how it varies just a bit. Each grade focuses on the core of this standard: making connections!! Standard three, particularly in 3-8 grade is one of the most misunderstood standards of the Common Core. Many people see the word connection and fall back to the idea of text-text or text-world connections. The standards require students to consider relationships between ideas, people, and events in the text. An easy way to think of this is that students are making connections between the nouns in the text. What does one thing have to do with another? How are two nouns related? Students are thinking about the relationships that they perceive and recognize. This demands the close reading of a text and the ability to make some judgment calls. Connections made by students will be diverse and varied. While most of these forms should seem familiar, the two forms that least familiar are the two forms that the Common Core standards explicitly discusses. These are the last two listed: One person/ Big Event and Big Event/ One person. Each of these is really a subset of Cause and Effect. 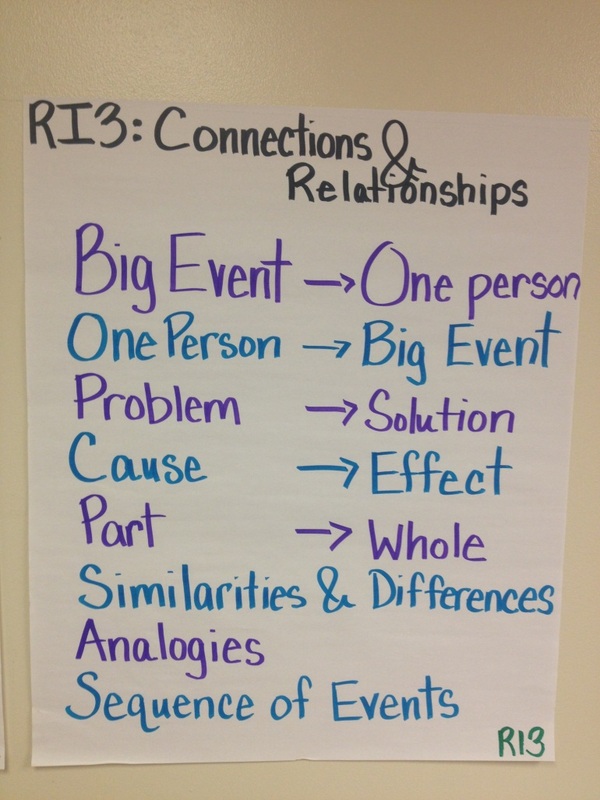 One Person/ Big Event is when students make a connection between how one person was able to influence a larger event. Often found in historical text, these relationships are characterized in the Common Core as an individual influencing an event. Examples might include the relationship between Rosa Parks and the bus boycotts or the relationship between Abraham Lincoln and the Civil War. Big Event/ One Person is the inverse causal relationship of One Person/ Big Event. This is where students consider how a broader event influences an individual person or groups of people. An example might include the relationship between the Holocaust and Elie Wiesel. When students work on Text Structures (Standard 5) they will begin to look at how entire sections of text are organized in these same ways. For Connections & Relationships students are simply tasked with pulling out events, individuals, and ideas and looking for these relationships. Here is a great anchor chart that I use to provide students with some guidance about possible ways that ideas and events can interact. These are great when examining sets of books, reviewing anthology stories, or even sending students on book scavenger hunts. I hope it is useful!! Its like you read my mind! You seem to know a lot about this and I appreciate it (it seems pretty rare these days. I feel like this is a little book on Common Core. This confirms my understanding of this standard. Great article! I am excited to gather more Common Core reading information and resources! Okay Roz Linder you officially have a fan here! I love the reading anchor charts that you post for reading. I am scooping them up for my classroom every time I see one. With Common Core this is pretty practice and easy to understand. Leave a Reply to Jessica Tweets Click here to cancel reply.